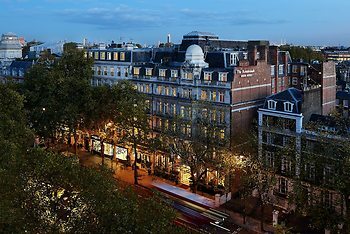 The Rembrandt Hotel, London, United Kingdom - Lowest Rate Guaranteed! Due to the exchange rate Euro to Pound the deal was really great.The Staff was very friendly. The location is very central it is close to the Piccadilly Line so you are able to go directly from the airport Heathrow to the Hotel without changing the Metro line. The de-luxe room was comfortable not big but for London standard really OK. I had booked room via internet and everything was OK, but when I arrived they did not have my name and reservation. Lucky enough room was available. It was a good hotel. The bar was great! We also enjoyed the breakfast! What a convenience. Thanks again. Not a noticeable Rembrandt hotel sign.